Small log cabins are the most popular log cabin kit with a typical size of ~ 1,100 square feet. Small log cabin plans come in different forms, sizes, styles and require different construction techniques. At Log Cabin Hub, we have hand selected 19 small log cabin plans, each along with a detailed design and instructions for how to build them. Once you have found the right plan, click on the build button to get more information. From a small cabin plan with a loft and 500 square feet, to a two bedroom log cabin plan with 1,000 square foot, you will find a variety of beautiful small log home plans. If you want a quick and easy to build cabin then this is the one for you. Although it doesn’t use the traditional building methods of a log cabin, you can still achieve a similar feel using log siding. This particular cabin was built by a family of 5, in just 5 days! There is also the option to expand the floor space by almost half, as this family did, by adding deck space. Made from full logs, this cabin is ideal for someone who wants to experience a true log cabin build on a small scale. It uses the very popular saddle notch which gives a typical log cabin finished. This cabin would be ideal for a fishing retreat or a tiny home getaway and it is perfect for a single occupant or a couple. These detailed photos will provide you with step by step instructions to build your own small log cabin. The plans take you through the process of debarking trees, right the way to installing the roof. This cabin also has a loft area which is perfect for a bedroom. It is off-grid and the couple who built this, built a seperate toilet outside. This basic log cabin would suit a single occupant or couple. The pack includes plenty of details including cross sections of the piers and footings, elevations and floorplans. This home would be more suited to those who are seriously considering tiny home living due to the very small size. If you’ve ever doubted your ability to build a log cabin from scratch, this one is for you. This cabin was built by two women and the walls, windows and doors were placed to minimize the amount of lifting they would have to do. This article takes you through laying the foundation, the walls and the roof as well as a photos of the process and a flooplan. The blueprints for this cabin were designed by Earl Hardy who has designed over 1,200 residential homes so you can be sure these are well thought out! The plans include step by step instructions on how to build the log cabin, as well as a detailed materials list. They also include elevations, floorplans and electrical wiring plans. Although defnintely fitting into the category of a tiny home, this 384 square foot home has been cleverly designed so that is can function just as well as a regular sized home. It has space for all the appliances you need as well as a loft space, which has ladder access for extra storage or sleeping space. This plan is a perfect example of what can be created using only the resources around you. For $100, this couple managed to create a small but perfectly comfortable home. It uses an uncomplicated design built on stilts. This design is completely off grid and can be built using no power tools. The designer of this cabin recommends always building your own cabin over buying a pre-fab kit. He believes it is more cost effective and proved this to be true when he only spent $2,200 on materials. This cabin is very basic on the exterior and the interior and so would therefore suit someone who wants a simple back-to-basics cabin. This log home has a great porch area to slightly extend the small living space inside. Although the living space is small, there is space for all necessities within the open plan living and kitchen space on the ground floor. Up the ladders to the loft space, there is space for a double bed. I would recommend this home for those looking for a guest house. This unique shaped log home was built for only $120 dollars. This plan gives detailed instructions from laying the foundation, to raising the walls and all the costs involved. This cabin would be ideal for those who don’t have acess to long logs, by creating a hexagonal shape with smaller logs, the internal floorspace is maximised. This small log cabin has a great porch area on the front. The plans come complete with floorplan, elevation and cross-section as well as a construction checklist which has handy hints and tips in it. The cabin itself has a good sized kitchen, dining and lounge area. 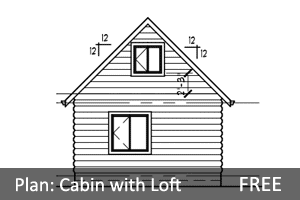 One of the larger homes that features in this free plans pack is the Pole Cabin. At 768 sq ft, it has enough space for two modest bedrooms and a bathroom. There is plenty of storage space and both bedrooms show storage on the floorplan. The plan itself includes eleavtions, floorplans and cross-sections of the buliding. This well detailed step-by-step account of building a log cabin would be very easy to follow if you wanted to build your very own family home. One on the larger cabins that we are featuring here, but there is plenty of flexibility on the design of the interior of the cabin. The method used to build this cabin is also one of the easiest possible. This would make a great home for a small family. With two bedrooms and a possible third bedroom in the loft space, there is also a decent sized Kicthen and Living Room. The plan has a covered porch area and also has detailed drawings of the kitchen cabinets, cross sections and wall details. This is the only plan featured in this pack that includes a balcony from the first floor bedroom. Each of the two floors are tiny, but with full use of the second floor it gives the home a larger feel. This plan is extremely detailed and comes with 29 pages of detailed drawings and plans, from electrical plans to cross sections of the walls. This plan would be perfect for those looking to build a basement due to elevations. The basement area adds a huge extra space to the home. The plan is very detailed and includes elevation drawings, framing plans for each level and floorplans. There is also the option of adding an extra decking area to the rear of the house. This plan is from the American Historic Building Survey and although the plans and photos are old – it would certainly provide a quality and good build today. This small log cabin has a loft area to which there is a balcony. Matching the time this log home was built in, it uses the traditional method of square hewn logs with thick chinking. This is a beautiful cabin. If you are someone that has considered tiny house living then you will definitely be interested. This home offers a classic look without using tonnes of space. Tiny house living isn’t something you rush into, but if you’ve done your research and want a smaller living space with less responsibility then this plan might be what you’ve been searching for. I would like to build me and my wife a small log cabin it’s been our dream to have one of our own.very nice and detailed log cabins.